This article is about the historical park that opened in 1903. For the current park that opened in 2010, see Luna Park, Coney Island (2010). For other uses, see Luna Park. Destroyed by fire in 1944, closed in 1946 after a second fire. Luna Park was an amusement park in Coney Island, Brooklyn, New York that opened in 1903. Built partly on the grounds of Sea Lion Park (1895), it was one of the three original iconic large parks built on Coney Island, the other two being Steeplechase Park (1897) and Dreamland (1904). Luna Park was located on the north side of Surf Avenue on a site between 8th street, 12th street and Neptune Avenue. The park was mostly destroyed by a fire in 1944. In 1901 the park's creators, Frederic Thompson and Elmer "Skip" Dundy, had created a wildly successful ride called "A Trip To The Moon", as part of the Pan-American Exposition at Buffalo, New York. The name of the fanciful "airship" (complete with flapping wings) that was the main part of the ride was Luna, the Latin word for the moon. The airship, and the later park built around it may have been named after Dundy's sister in Des Moines, Luna Dundy Newman. Luna Park under construction in January 1903. This picture was taken on the day Thompson and Dundy executed Topsy the elephant (standing in the middle of this image). At the invitation of Steeplechase owner Harry George Tilyou, Thompson and Dundy moved their show to Steeplechase Park, a Coney Island amusement park, for the 1902 season. The deal ended at the end of the summer after Thompson and Dundy rejected a Tilyou's contract renewal offer that cut their take of the profits by 20%. At the end of the 1902 season Thompson and Dundy signed a long-term lease for Paul Boyton's Sea Lion Park. Sea Lion, the first large scale enclosed park at Coney island, had opened 7 years before. The park had several centerpiece rides but a bad summer season and competition with Steeplechase Park made Boyton decide to get out of the amusement park business. Besides the 16-acre Sea Lion Park Thompson and Dundy also leased the adjacent land where the Elephantine Colossus Hotel had stood until it burned down in 1896. This gave them 22 acres, all the land north of Surf Avenue and south of Neptune Avenue and between W. 8th and W. 12th Street, to build a much larger park. Interior of Luna Park at night, 1905 with its centerpiece, the "Electric Tower" in the foreground. Thompson and Dundy spent $700,000 (although they advertised it as $1,000,000) totally rebuilding the park and expanding its attractions. The park's architectural style was an Oriental theme with buildings built on a grand scale and over 1,000 red and white painted spires, minarets and domes. At night all the domes, spires and towers were lit with over 250,000 electric lights. At the center of the park in the middle of a lake was the 200 foot tall Electric Tower that was decorated with twenty thousand incandescent lamps, a smaller version of the Electric Tower that was the crowning feature of the Pan-American Exposition two years earlier. At the base of the tower was a series of cascading fountains. Eventually two circus rings were suspended over the central lagoon to keep customers entertained between rides. 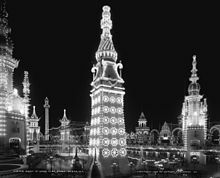 Calling itself "The heart of Coney Island", Luna Park turned on its lights and opened its gates to a crowd of 60,000 spectators precisely at 8:05pm on May 16, 1903, coinciding with the timing of sunset on that Saturday night. Admission to the park was ten cents with rides costing extra, up to 25 cents for the most elaborate rides. The park was accessible from the terminals of the West End and Sea Beach railroad lines. Although Luna Park was a success, competition for visitors ramped up on Coney Island. The next year a third large-scale park called Dreamland opened up. Dreamland featured 4 times as many lights as Luna Park, an even bigger central Tower, and attractions such as "The End of the World", "Feast of Belshazzar and the Destruction of Babylon", and Lilliputia, a miniature village populated by little people. In 1907 Dundy died leaving Frederic Thompson to run Luna Park until 1912 when he went bankrupt and lost the park to creditors, although he continued as manager. Luna Park would continue under different management over the years with rides constantly being changed and updated. The Great Depression saw the park go into bankruptcy several times starting in 1933; owners came and went but none seemed to be able to make a profit. Many of the exhibits, rides and shows from the 1939 New York World's Fair moved to Luna Park after the Fair closed and Luna was billed as the New York World's Fair of 1941. With the US entry into World War II Luna was allowed to stay open as a morale booster but had to keep its lights dimmed for wartime security. A pair of fires in 1944 damaged Luna Park, destroying much of it. It was not rebuilt and did not open for the 1945 season. After a legal battle and a third fire in 1946, the land was used for other purposes. The original Luna Park now houses a five building cooperative apartment complex and is still called Luna Park to this day. The Dragon's Gorge at Luna Park. The ride caught fire in 1944, ultimately leading to the closing of the park two years later. The mechanical escalator to the top of the Helter Skelter. Trip to the Moon, a roller coaster moved the Coney Island Bowery in 1924 and originally named Drop the Dip. There were also a "Grand Ballroom", concerts, fireworks, and carnival performances. Thompson and Dundy were constantly changing the park's attractions such as replacing the "20,000 League Under the Sea" in 1905 with the indoor scenic railway called "Dragon's Gorge". Although the building of the park included the infamous publicity stunt where Thompson and Dundy executed Topsy the elephant by electrocution, park owner Dundy became fond of the animals and elephant rides became a feature of the park. Roscoe Arbuckle's 1917 movie Coney Island features Luna Park. The 1928 Oscar-nominated King Vidor movie The Crowd includes a double date sequence filmed at Luna Park. Part of Harold Lloyd's 1928 movie Speedy was shot at Luna Park. The song "Meet Me Down At Luna, Lena" was recorded by Billy Murray in 1905 to promote the park, among others. The song was rerecorded for the 2007 documentary film Welcome Back Riders. On May 29, 2010 a new amusement park named "Luna Park" opened at the former site of the defunct Astroland park, a parcel of land on the south side of Surf Avenue just across from the original Luna Park site. The new park, which includes new semi-permanent rides, games, food and beverage concessions, and live entertainment, features an entrance patterned after the entrance to the original 1903 Luna Park. ^ "Electrocuting an Elephant". The Bendigo Independent (10, 226). Victoria, Australia. 21 May 1903. p. 6 (SUPPLEMENT TO THE BENDIGO INDEPENDENT). Retrieved 31 March 2017 – via National Library of Australia. ^ "Spectacular Fires on New York Waterfront and Amusement Park". The Examiner. CIII (133). Tasmania, Australia. 14 August 1944. p. 1. Retrieved 31 March 2017 – via National Library of Australia. ^ "Fire Destroys Luna Park". The News. 47 (7, 229). Adelaide. 3 October 1946. p. 4. Retrieved 31 March 2017 – via National Library of Australia. ^ David A. Sullivan. "Thompson and Dundy's Luna Park (1903-1944)". www.heartofconeyisland.com. Retrieved 21 February 2016. Billy Murray and the Haydn Quartet sing "Meet Me Down at Luna, Lena"
Wikimedia Commons has media related to Luna Park, Coney Island. This page was last edited on 15 December 2018, at 20:29 (UTC).